(noun) Crop milk is a semi-solid, crumbly excretion high in fat and protein that some bird species feed to baby birds during the first days after hatching. Unlike mammalian milk, crop milk or bird milk does not have any calcium or carbohydrates. It is not generated by mammary glands, nor do young birds suckle on a teat to feed. Crop milk is only fed to young birds for a few days until they are able to digest other foods, and parent birds may gradually mix adult food in with the young birds' diet to wean them off crop milk. To feed on this unique milk, young birds stick their bills into their parents' mouths to stimulate the production and release of the substance. In some species, such as pigeons, both male and female birds can and do produce crop milk to care for their young. In other species only one gender may produce this food, but it could be either the male or female parent. For example, male emperor penguins produce crop milk, but females do not. Because the milk not only contains nutrition for the young birds but also has immune-building properties with antioxidants and antibodies from the parent birds, it is believed to play a significant role in the developing health of young birds. Further detailed study and analysis of different types of crop milk and the birds that produce it is needed to determine the exact role it plays in the diet of young birds. Ornithologists are also interested in how more or less crop milk may affect the development and maturity of chicks and how their survival rates may differ from other birds. All pigeons and doves feed their young crop milk. For these species, the milk contains sloughed off, liquid-filled cells from the inside of the parents' crop. The crop switches from part of the parents' digestive system to milk production just a day or two prior to the eggs' hatching, a switch believed to be caused by hormonal changes. During that time, the parent birds may cease eating altogether so there is no seed in the crop, which very young birds would be unable to digest. After several days of feeding young pigeons milk, the hormone levels taper off and the crop ceases to produce as much milk. At this time, the young birds are better able to digest seeds, insects, and other foods regurgitated by their parents. 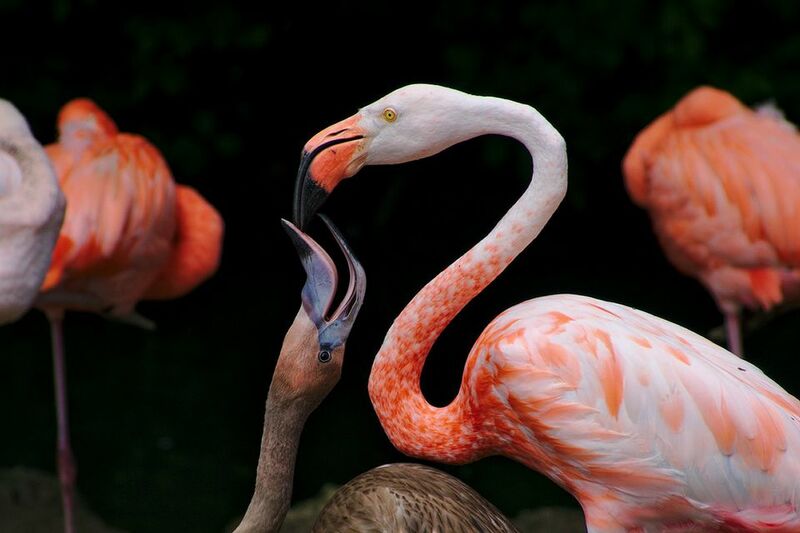 Flamingos produce bird milk through glands along the digestive tract. Young flamingos eat this milk until they have developed the mature filter feeding apparatus in their bills to allow them to feed on solid food. It takes roughly two months for young flamingos to develop well enough to eat mature food, and until that time, they feed exclusively on crop milk. While they are eating crop milk, however, they may still practice feeding as they learn how to use their bills, but they are not ingesting enough mature food to meet their nutritional needs. Male emperor penguins will also generate a milk-like substance from the esophagus to feed young chicks after hatching. This is especially critical if the fishing females are late returning from the ocean with food to regurgitate. This type of feeding generally only lasts a few days, and after the females have returned, they alternate hunting duties with the males and are able to feed chicks regurgitated fish instead of relying on crop milk. What Else Is Crop Milk Called? While the term crop milk is universally accepted to describe this unusual part of a baby bird's diet, it is also occasionally called pigeon milk, pigeon's milk or bird milk. These terms can be slightly misleading, however. Pigeon or pigeon's milk would seem to imply that only pigeons produce this substance, while bird milk makes it sound as if all birds offer their chicks a type of milk. Neither of these is true, but birders who know the details about crop milk understand how important it is to baby birds, no matter what it is called. What Does an Omnivorous Bird Eat?